In today's memorable edition of Speak Up on Kotaku, commenter Eatplaysleepmore thinks he's found a major character flaw in Bethesda's latest masterpiece. Do you agree? Just how forgettable are these characters? I just finally finished Skyrim, kinda had to deal with some massive issues to finish it though (one of the unlucky PS3 copies). 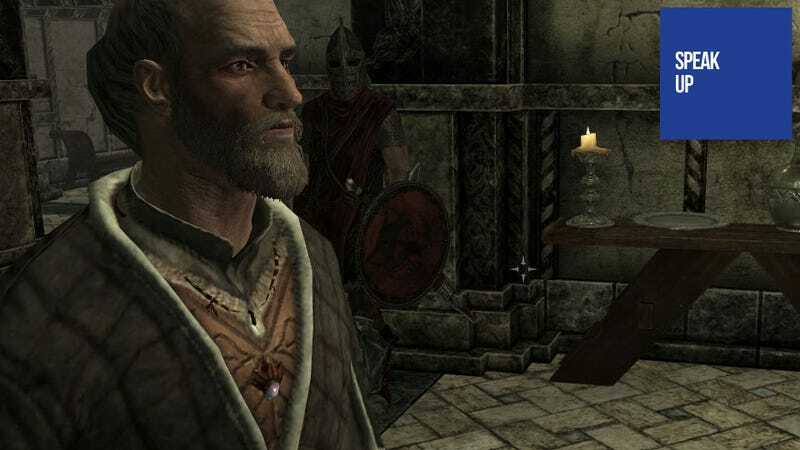 Story was ok, but here is my biggest realization, the characters in this "real living world" (as some Skyrim fans like to call it because they do jobs and stuff) are so non-existent. I am trying to remember names of most of the people and I just can't. Ulfric Stormcloak and Alduin are the only ones I can remember, obviously because they play the biggest role in the story but that's really it. Now I know a lot of people hated most (if not all) the characters from Final Fantasy XIII (hell I do too) but the names and faces stay with you. If someone came up to you and asked you a question about Lighting, her face would show up in your head and the way she dressed(maybe even her voice). But if I were to ask, hey remember those siblings in the first town you run into? You would be like oh yeah, I forgot what they looked like and their names though. Even with Dragon Quest 9, where you made your own silent character, I can recall 5+ names in there than I can with Skyrim. I am just hoping Bethesda adds more "character" to these people, yeah I get that this is "my" story but can't I have some memorable interesting characters to interact with along the way?